x is the first operand which is a variable of a nullable type. y is the second operand which has a non-nullable value of the same type. While executing code, if x evaluates to null, y is returned as the value. Also remember that the null coalescing operator (??) is right-associative which means it is evaluated from right to left. So if you have an expression of the form x ?? y ?? z, this expression is evaluated as x?? (y?? z). Note: Other right-associative operators are assignment operators, lambda and conditional operators. Now with an overview of the C# Null Coalescing operator, let us see how to use the Null coalescing operators in practical scenarios. Consider the following piece of code where we are assigning a nullable type to a non-nullable type. In the code shown above, if ‘a’ has been assigned a non-null value, then this value will be assigned to the int b. However since the nullable type ‘a’ has been assigned null, the value to the right of the operator (??) i.e. zero will be assigned to b instead. The value of b if printed, is 0. The value A can now be accessed and will return 1. Quite a handy technique using the Nullable type and the Null Coalescing operator! There are some more ways the Null-coalescing operator can be used. I have covered some basic uses in my article Different Ways of using the C# Null Coalescing Operator. Like any other feature, use it ‘only’ when required. 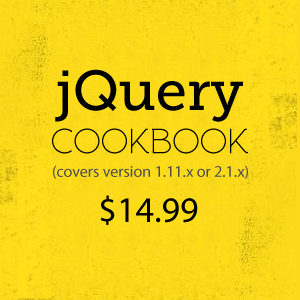 It can greatly enhance your code, making it terse and pleasant to read! The reason you get an invalidoperationexception is that you are accessing a getter of an object which is null - a.Value. Where you illustrate the coalescing fix you use int b = a ?? 0. If you changed this to the original syntax int b = a.Value ?? 0 you would get the exact same exception. Jason: I tried to show a cleaner and better way of writing that code and I did not mean to do a comparison here. 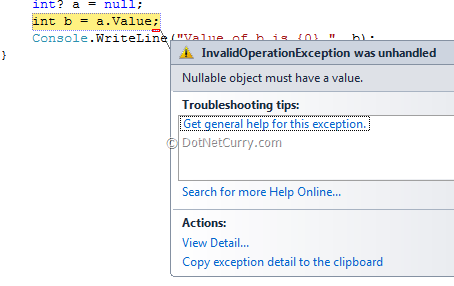 The reason we get an exception is that the value (null) of Nullable<int> cannot be represented in an int. So you either do a cast or in the IF..ELSE, we assign a value that the int can represent. However in case of a null coalescing operator, the code is a lot cleaner - If the nullable type contains a non-null value, assign it to the int. If not, assign the value of the right operand. Neat, easy to understand! Sorry if the example was confusing for you. The reason an exception is thrown is because accessing the a.Value property will throw an exception. In the first example, the int (b) is not set, the exception is thrown before that takes place. For example 'string c = a.Value.ToString()' will still throw the same exception, it will not throw a NullReferenceException which it would do if you could access the a.Value property.